Budapest, Hungary. 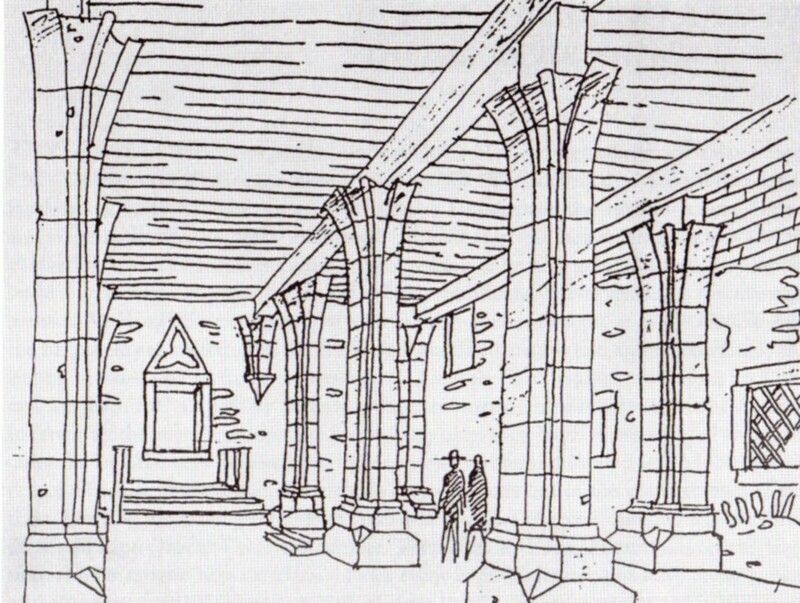 Graphic reconstruction of the interior of the Great Synagogue of Buda based on the 1964 excavation . From Budai, Középkori zsinagóga a budai várnegyedben / Medieval Synagogue in the Buda Castle Quarter (Budapest, 2007). Budapest, Hungary. 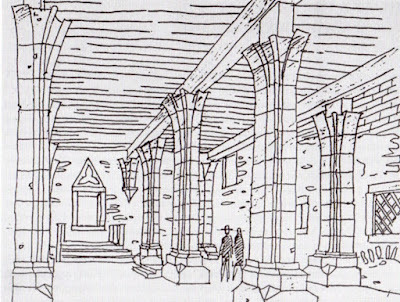 Hypothetical reconstruction of the interior of the Great Synagogue of Buda after the rebuilding following damage of 1530 and 1541. From Budai, Középkori zsinagóga a budai várnegyedben / Medieval Synagogue in the Buda Castle Quarter (Budapest, 2007). (ISJM) Tomorrow in Budapest (September 19) there will be a conference about the past and future of the former Great Synagogue of Buda, one of Europe's most important and least known medieval Jewish monuments. The remains of the one of the last of the great double-nave synagogue structures erected, and one of the largest built lie four meters beneath a mound at number 23 Mihaly Tancsics Street in the old city of Buda (now part of Budapest). As I don't read Hungarian, I hope that the results of the conference are summarized in English or another language. The Great Synagogue of Buda was built as an initiative of community leader Judah Mendel after 1460 in was built in the courtyard of the Mendel home, near the Viennese Gate and next to the Buda city walls. The synagogue and Buda’s Jewish community were violently destroyed when Turkish rule was overthrown by the Austrians in 1696. Knowledge of the synagogue came from a contemporary description by Isaac Schulhof of its destruction and the massacre of the Jews who took refuge within. Aurel Budai, who was a young architect drawing ancient monuments for the planning office of the Municipality of Budapest when the synagogue was excavated in 1964. Budai spent much of life advocating for the re-excavation of the site and its development as an important historical and cultural resource. He died in 2012, 48 years after the excavation was ended prematurely, without his dream coming true; but there is hope. Already in 2004 Budai had begun to create of coalition of cultural groups in favor of the excavation and in 2007 he published a small book (Középkori zsinagóga a budai várnegyedben / Medieval Synagogue in the Buda Castle Quarter) presenting a summary of the history and archaeology, and especially his plans for the building's eventual reconstruction. The project is not an especially difficult one - much simper, for example, than the excavation of the medieval synagogue in Vienna. But the project needs money to proceed. Sometime around 2012 the Schulhof Foundation for the Restoration of the Medieval Synagogue of Buda was founded to promote new excavation and restoration. In recent months yet another coalition for this project was formed, and the conference and accompanying exhibit are the result of this new effort. Budapest, Hungary. 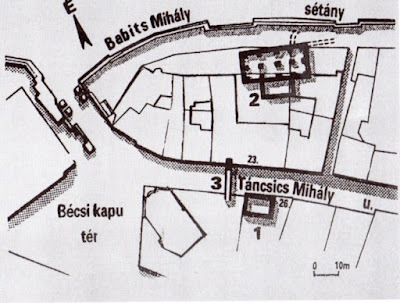 Plan of Buda showing location of the Great Synagogue (2) and relation to so-called Syrian Synaoggue (1). From Budai, Középkori zsinagóga a budai várnegyedben / Medieval Synagogue in the Buda Castle Quarter (Budapest, 2007). Budapest, Hungary. 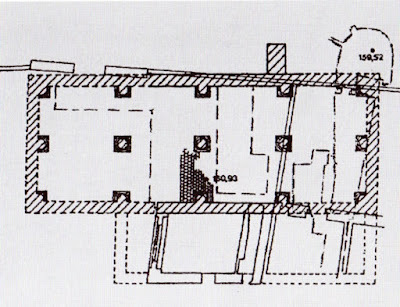 Plan of the Great Synagogue. From Budai, Középkori zsinagóga a budai várnegyedben / Medieval Synagogue in the Buda Castle Quarter (Budapest, 2007). 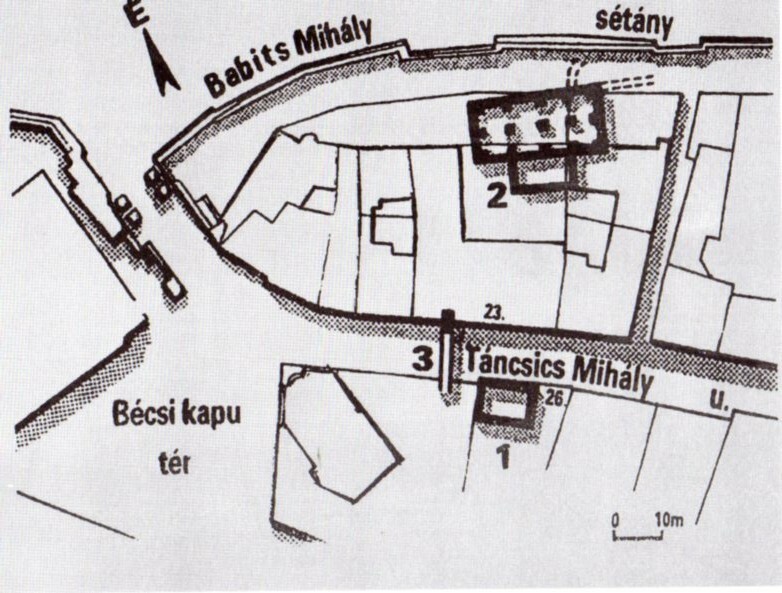 Substantial remains of the former great synagogue and other elements of this Jewish quarter, including another synagogue and parts of the Mendel houses, were revealed during the 1964-66 excavations around numbers 23, 26, and 28 Mihaly Tancsics Street. Because the results of the excavations were not completed, and the results were only been published in Hungarian, they still remain little known outside of Hungary. The excavations confirmed the destruction described by Shulhof. In addition to cannon balls and shrapnel, charred bones of Jews killed in the assault were found in the remains of the synagogue’s geniza, where they had apparently been placed prior to burial—a burial that never took place because the synagogue remains were burned in a giant fire that swept the city. 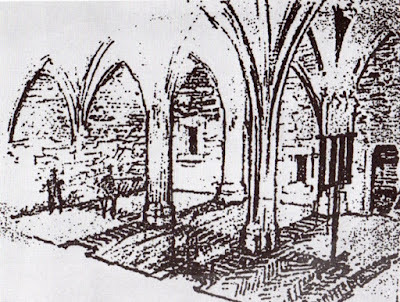 The floor of the Great Synagogue was set below ground level. Thus, despite its important to the Jews of Hungary, and the prominence of Judah Mendel, it was kept hidden from the street and lower than churches in the area. 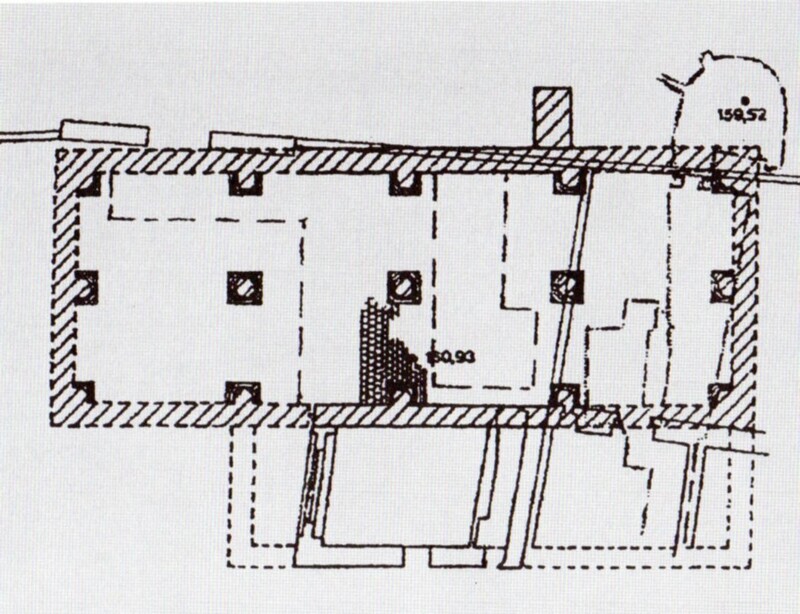 The height of the synagogue vaults is believed to have been between 7.5 and 8 m. The synagogue interior originally measured 19 x 9 m., and after 1541 it was extended to 26.5 x 10.7 m., twice as long as the Altneushul in Prague. The synagogue is believed to have three supporting piers set on its longitudinal axis, dividing the interior into two equal naves. As in Prague, the piers were octagonal and supported Gothic rib vaults, thus creating a space of either six or eight bays. The women’s area adjoined the men’s on the south and was connected to it by windows. On the same side a large entrance arch opened into the men’s section. Budapest, Hungary. 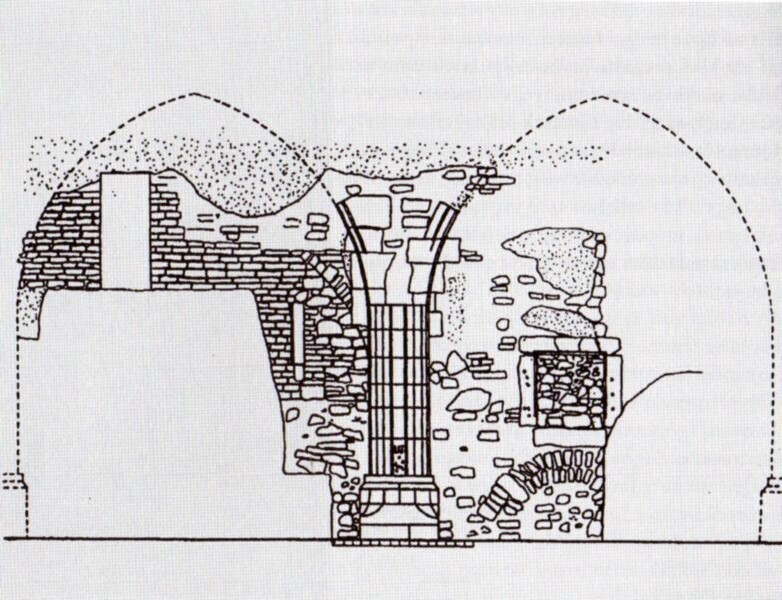 Great Synagogue, wall elevation revealed in 1964 excavation. From Budai, Középkori zsinagóga a budai várnegyedben / Medieval Synagogue in the Buda Castle Quarter (Budapest, 2007). The archaeologists surmised that the synagogue was damaged during the sieges of 1530 and 1541, during which the vaults were probably substantially damaged, causing their replacement by a wood roof. A plaster floor in the main sanctuary was apparently destroyed in 1541 and some walls were also destroyed at this time. Thus, even before the final destruction in 1686, the synagogue had also suffered and been remodeled. Between 1684 and 1686, apparently only the women’s area was in good enough condition to be used as a synagogue. The eyewitness account known as the Megillot Buda, was written by Shulhof (1650-1733), a son-in-law of the Great Synagogues’ eminent rabbi Ephraim Ha-Cohen. The work, written in Hebrew, has been translated into Hungarian. An partial English translation can be found in Eli Valley, The Great Jewish Cities of Central and Eastern Europe (Northvale, N.J.: Jason Aronson, 1999), 424-425. On the excavations see Laszlo Zolnay, Buda kozepkori zsidosaga (Budapest: Budapest Történeti Múzeum kiadása, 1987). For a brief account in English see Krinsky, Synagogues, 154-155. For a longer narrative account of the history of Buda’s medieval Jewish community and the story of the synagogue’s destruction see E. Valley, Jewish Cities, 408-425 and for history, archaeology and ideas for reconstruction see Budai Aurel, Középkori zsinagóga a budai várnegyedben / Medieval Synagogue in the Buda Castle Quarter (Budapest, 2007).